Submitted by lmcshane on Sun, 01/31/2010 - 16:51.
and animal life at the Cleveland Metroparks Zoo. I was totally wrong on the plant--mea culpa. Submitted by lmcshane on Sun, 01/31/2010 - 20:10. Submitted by lmcshane on Fri, 03/25/2011 - 17:41. On my way to swim today--I took a detour off of Wildlife Way, the winding road that cuts through the Metroparks Zoo. 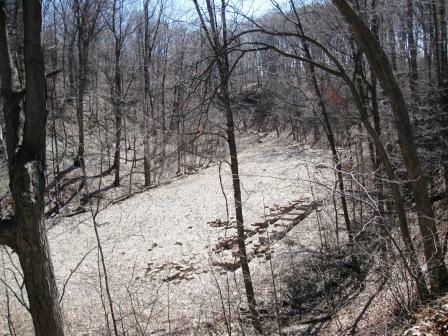 There are several deep, wooded ravines and approximately four acres of woodland just south of the formal zoo grounds. If you venture to this forgotten world, you will find yourself spooked by the erie beauty of the terrain. And, you will feel eyes upon you. The lost boys live here. Submitted by greatboldworld on Fri, 03/25/2011 - 17:55. There used to be a road we kids called "snake road"...it connected into your road right by the zoo entrance, near where the old round Brookside swimming pool was. It was unlit and twisted a bit up to the neighborhood N. of Memphis Ave. Maybe it came around Henritze and W. 40th. Also, there was a set of metal steps from the bottom of the hill that went up there a little further west. And, some stone ones near there too. In summers, between baseball and that pool, some of us practically lived in Brookside Park. Submitted by lmcshane on Fri, 03/25/2011 - 18:02. Submitted by savcash on Fri, 03/25/2011 - 22:41. Knowing the snake couldn't bite me with the frog in his mouth; I grabbed him right behind the head, took the frog, and put it in my bait bucket. Just then, I realized I had a problem, how was I going to release the snake without getting bit? So, I grabbed my bottle of Jack Daniels and poured a little whiskey in its mouth. The snakes eyes rolled back and he went limp. I released him into the lake without incident and carried on fishing using the frog. Submitted by lmcshane on Fri, 03/25/2011 - 18:14. I am old enough to remember the POOL that used to be on the zoo grounds. Brookside Park is still a gem. Generations grow up in Brookside Park. I worked at the zoo during my teenage years. Submitted by greatboldworld on Fri, 03/25/2011 - 18:49. The pool wasn't really in the Zoo. But the elephants were in plain sight very close to the fence. We would play ball over at the diamonds and wear our trunks (or just cut-offs) underneath. Then, we'd either walk the tracks to the parking lot and go into the pool. We all knew where there were holes in the fences. Or, we could sneak into the zoo behind Monkey Island (over the fence! ), or, climb the hill and go under the fence up by the polar bears. Baseball and swimming. Couldn't beat it. Submitted by greatboldworld on Fri, 03/25/2011 - 18:36.
Who remembers the old steam train and coal car that we played on right by the Big Creek pedestrian bridge? Who remembers when the Cuyahoga Valley Rail line ended in the parking lot below that old train, smack in the middle of Brookside Park? The public restroom at the top of the twisty road at Denison and Fulton? With the public water fountain in front? How about the ice cream joint on Denison right by the Brookside bar? How about the MASSIVE concrete grandstands built into the hillside in the bowl above Diamond No. 1.? Did you know how to turn on the lights for No. 1? We did..and did. Such delinquency! And now??? Right. Submitted by ANGELnWard14 on Tue, 03/29/2011 - 17:30. How about the "Farmer's Market at Fulton/Denison??? Submitted by ANGELnWard14 on Tue, 03/29/2011 - 18:08. Or the farmer's market on Robert & Fulton? Or the Flower Shop on West 44th St. & Hyde? Or the Doll House Store on Fulton near Carlyle? Or Ricardo's Fine Italian Restaurant on Sackett & Fulton? Or the Villa Bar on Fulton & Roehl? Or Walking to the Corner Store without adult supervision? Or jumping in the water puddles during a rain storm? Or riding mini bikes & go carts up n down the neighborhood streets? Or having slumber parties with seances? Or having tea parties with your girlfriends? Or going to see the Harlem Globetrotters at the old Coliseum in Richfield? Or going to Quigley to watch the Hot Rods & Motorcycles race in the wee hours of the night? Or catching RiTA all over town for scenic trips to Parma Town, Terminal Tower or whereever you needed to go, particularly school. Or going Ice Skating at Brooklyn Recreational Center? Or swimming at Michael J. Zone Rec Center with Mom and going to the "steam rooms" when they were still "family friendly places"? Or playing sports and going on camping trips with Clark Recreation Center? Or being able to visit countless relatives without ever using a car (Until they all moved out of the city limits!)? ....Or riding your bicycle all over the neighborhoods until your parents had to go to that bicycle guy on West 52nd who sold used bikes out of his garage and had such a variety that you could only hope to get your next second hand bike there? Or playing baby dolls with the girl next door? Or watching your mom and several other mothers sit on the front porch swings sipping coffee while all the kids in the neighborhood played innocently on that street. Submitted by greatboldworld on Tue, 03/29/2011 - 20:06. It sets the scenes well. A person who'd never been to Clevetown can see a child able to grow up with safety and freedom. Schools and safety--what part of that can't folks get? Oh, I know--let's get some funding for our non-profit and set things right. Oops. Sorry. Submitted by lmcshane on Wed, 03/30/2011 - 08:20. 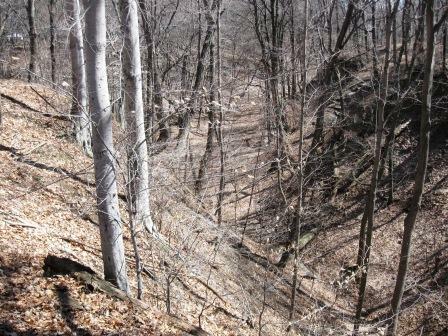 Two more images of the deep ravines and wooded valleys haunted by the lost boys. Disenchanted youth from all over the county show up here. Boys, especially, because they don't fully understand the changes in their body. Sometimes, they are happy to be with their tribe, feeling invulnerable and exhausting their mysterious, new masculinity by riding their bikes up and down the rough terrain. Other days, I see them sullen, angry and dark, walking along the railroad tracks--even laying on the tracks. Desperate for an explanation and mad, mad, mad at the world. This is a special place. But, not a great place for a girl. Submitted by greatboldworld on Thu, 03/31/2011 - 11:54. I enjoy the pictures of Clevetown that get posted here. I try to figure out where they might have been taken. I wouldn't read too much into the "lost boys" idea, though. We just thought we were goofing off, in between ball games, or swimming. As for skipping school, going to the park was kind of dumb. Might as well hang out on the streets or in someone's basement, attic, whatever. No, hanging in the park was for pre-losers, those who were drifting away from school, or work. Pre-losers who mostly wound up living on someone's couch, or their porch, basement, garage, etc. I suppose it has a kind of ease to it. Then, boredom sets in for most of us. I mean, how much dope can you smoke while you watch re-runs on channel 43, or 19, all morning and afternoon? The cheap beer gets old too. Sports, girls, cars, music, buds, school, work, and well..........life, start to look pretty good next to another week of eating cheerios at noon and soap operas in the afternoon. These don't really seem like lost boys, but more like lost men who want to be boys. Submitted by savcash on Thu, 03/31/2011 - 19:15.
seeing the name here realneo (north east ohio I assume?) speaks little of lake county and surrounding as well. Submitted by ANGELnWard14 on Wed, 03/30/2011 - 12:42. .....alongside the train rails in our very own backyards. They creep up into the neighborhoods in the wee hours of the night and do wierd things including stealing necessary items for their new "CAMPS" alongside brookside hill. I had some put up a tent that they had stolen from down the way in my back yard one time. I was totally freaked out and feared going near it. The police said it was something that's been going on for generations. Whether kid or adult, you must be leary throughout that area.....because people and wild animals DO Lurk there! (Good and bad)... but that is life anywhere i suppose. Kids used to runaway and think that they could hop on those trains to God Only knows where? I recall one of my childhood friends doing just that... I was so worried about her that I told my folks and sure enough, they found the pre teen runaway kids down by Quigley trying to catch trains....She was so mad at me when she got home....but by the grace of God, we are friends to this day! Submitted by lmcshane on Tue, 05/03/2011 - 08:03. Hoodwire... Low income wireless not next... now!